Free Anatomy Quiz - Articles : What are the names and functions of the two main layers of the skin? What are the names and functions of the two main layers of the skin? 1. The outer layer of the skin is called the ____________. 2. The inner layer of the skin is called the ____________. 3. Melanin is produced in the top sub-layer of the epidermis by ______________. 4. The stratum corneum is the _________ layer of the epidermis. 5. The epidermis includes ________ sub-layers. 6. Nerve endings are contained within the __________. Epidermis - The epidermis is the outer layer of the skin and is formed of five sub-layers. From outer to inner, the layers are named the stratum corneum, stratum licidum, stratum granulosum, stratum spinosum, and stratum germinativum (or stratum basale). The stratum germinativum is where cells divide and push already formed cells into higher layers. As the cells move into the higher layers they eventually die, and the top layer of the epidermis, the stratum corneum, is made of dead, flat skin cells that shed about every 4 weeks. 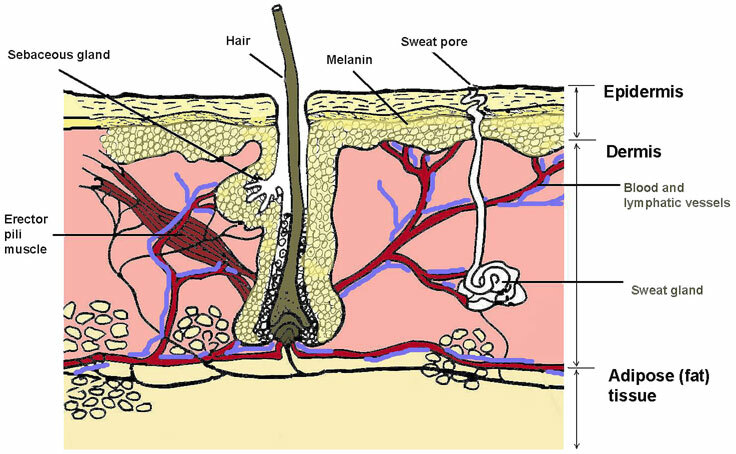 This layer contains melanocytes, which produce melanin (the pigment which colours the skin and protects it from ultraviolet radiation), and also Langerhan's cells, which are part of the body's immune system. It also contains tiny openings (pores) that allow sweat ducts and hair follicles to push through from the dermis below. Dermis - The dermis is the inner layer of the skin, lying above the subcutaneous fat layer. Formed in two layers, the papillary (thin) and the reticular (thicker and tougher), it is formed mainly from areolar tissue, white collagen fibres and elastin, and is a tough yet stretchable tissue able to allow growth. It contains nerve endings and cells (which act as sensory receptors to pain, itch, temperature, touch and pressure), sweat glands (which produce sweat to help regulate body temperature), sebaceous glands (which produce sebum, an oily substance that helps keep the skin from drying out and keeps the hair soft, and also combines with sweat to form an anti-fungal and antibacterial layer on the skin), hair follicles (the sites of hair growth), and a fine network of blood and lymphatic vessels (responsible for an exchange of oxygen, nutrients and waste products).